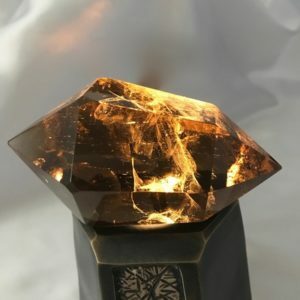 This blog article is by Lawrence Stoller, a lapidary artist who who has an amazing connection to crystals. We are proud to carry his products at Crystal Light and Sound. 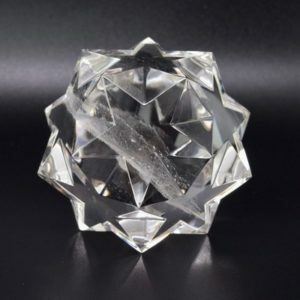 Sign up for his blog to gain insights on crystals from a master cutter. Why do people meditate with crystals? I am preparing for a show of my work. The usual suspects appear: chaos, frustration, fear. They spill all over my day like glue. The lobes of my brain feel compressed. A to do list is spreading like wildfire: pieces to finish, people to call, displays to make, money to be spent. I let my tornado mind spin, the debris bouncing off my brain like hard rain hitting the windshield. I need to stop the mayhem, to slow it all down, a change of scenery. Picking up a crystal, I sit down, close my eyes, and slip into meditation, moving beyond the riffraff of disjointed thoughts and entangled emotions. In the same way crystals are used to align radio waves, they can also focus and tune disjointed and competing thoughts and emotions. Without a tuning device, a radio will break in and out of stations. In a similar way, a crystal can work as a tuning device for the brain, facilitating clear, organized, and aligned thought—allowing you to tune in. One can also program crystals to perform different functions, similar to the way a computer is programmed to perform a variety of tasks. I have “programmed” a crystal for meditation. My having used this crystal many times, it is now a touchstone that stores the vibrational resonance of a deep state of meditation. When I pick it up, the Law of Resonance insures that the crystal and I synchronize. As a result, my consciousness glides easily, triggering my brain to release the chemical neuropeptides that alter my electromagnetic field. Magically, a peaceful tide washes over my body, as my mind becomes more lucid. I plunge like a scuba diver, using the crystal as ballast to keep my consciousness alert while submerged. 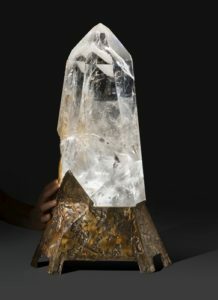 The crystal is my inner dimensional traveling companion, a vessel I have cut and angled specifically to transport me. It accompanies me as both navigator and compass: a mix of copilot and technical apparatus, nestled comfortably in my hand. Like a high tech instrument, the crystal amplifies my deep brain theta waves, creating an enriched mental timbre. These very precise, emotional coordinates replace haphazard thoughts. My hand becomes calm and relaxed from the contact, which spreads peaceful sensations throughout my body, harmonizing with the cadence of the crystal’s piezoelectric pulse. As I finish meditating, I ascend from the depths to the surface of my awareness, delivering more of myself to the beach of my everyday life. And there I rejoin the me who has been waiting on the shore, observing the horizon of a new reality. Why meditate with a crystal? Because it helps concentrate the mind to be focused, productive, energized and expansive.